Diane Von Furstenberg may be famous for having invented the jersey wrap dress and other iconic fashion designs, but now she is also famous for her chic home collection: DVF Home. The collection, which debuted in February, includes a line of rugs, bedding and tableware and other home accessories. In an interview with House Beautiful, she said, “color and pattern are important in all my designs,” von Furstenberg says. Shown here is an electric and gorgeous tablescape that von Furstenberg created for House Beautiful magazine. She’s always used eclectic prints and bright colors in her fashion collections and she’s carried on that love of print and color into her home collection as well. Just about everything here is by von Furstenberg: the flower vases, votives, place mats, flatware, plates and napkins. 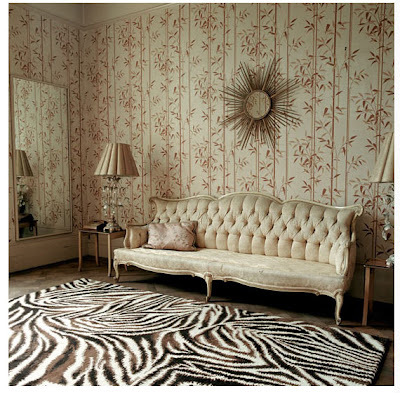 Von Furstenberg has quite several rugs through The Rug Company that she has been selling since 2009, all of them beautiful, but this is my favorite (eh, what can I say? I’m a sucker for zebra print!). This 100% Tibetan wool rug would look gorgeous in any room! Make sure to add other accessories to the space such as table lamps, end tables, and mirrorsto pull the room together. This serving tray, and many other items in her home collection, was inspired by Joan Miro. This tray is quite beautiful in person, I’d use it as a decorative object and place it on a mantel or a coffee table and a little collection of tchotchkes. Pretty floral batiks in vivid colors in this duvet will brighten up any room. 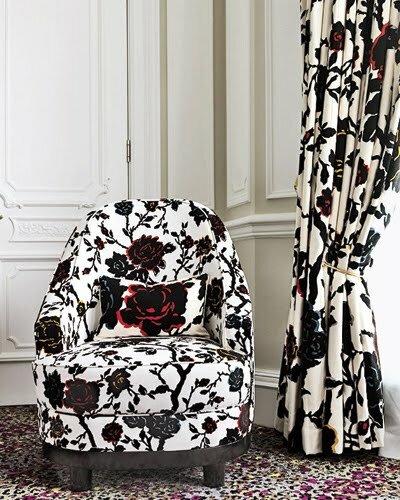 This fabric, called China Vine, was inspired by a dress from her 2008 collection. This image is from Claridge’s Hotel in London that von Furstenberg designed. Yes, she’s an interior designer too! Von Furstenberg also sells a line of fabrics, so now fans of this fashionable line are free to upholster to their hearts desire. Pair a couple of throw pillows in blue leopard with a settee in black and tan tiger stripes. Von Furstenberg said, in an interview with Oprah magazine, that home “is a projection of who you are.” If who you are is bold, bright, glamorous and a little bit eclectic, then you’ll love this collection. You can find the DVF Home Collection at Bloomingdale’s or Neiman Marcus. Content provided by Arcadian Home Decor, a site that specializes in top quality home decor items at extremely affordable prices. Come visit us today! I came across your blog and was very interested in your home design articles. I just had a couple of questions, so if you could e-mail me back that would be great! Thank you for your time.